Click to see the book. 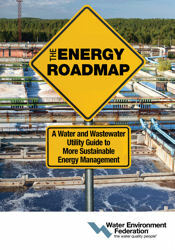 The Water Environment Federation (WEF; Alexandria, Va.) has released The Energy Roadmap: A Water and Wastewater Utility Guide to More Sustainable Energy Management. Published earlier this year, the book is a guide for utilities to take advantage of sustainable energy sources. The book details approaches to cost-effective recovery and reuse of “wastes” to transform them into resources. Designed as a user guide, it outlines six stops on the path to resource recovery, with insights and models for strategic management, creating an organizational culture, effective communication and outreach, demand-side management, energy generation, and innovating for the future. It includes steps for all sizes of utilities with a variety of energy sustainability goals and a guide for setting priorities and choosing practical approaches. “The Energy Roadmap: A Water and Wastewater Utility Guide to More Sustainable Energy Management will help to innovate and cost-effectively turn treatment facilities into ‘green factories,’” said Edward H. McCormick, wastewater engineering manager at East Bay Municipal Utility District in Oakland, Calif.
WEF began working to develop this book and other related resources in 2012.